Kidlings is a vibrant and fun space for our littlest kids (ages 1-5) to discover God created them, He loves them and Jesus is their friend forever. Our Kidlings team partners with you to encourage your child’s understanding of God and grow their faith. Your child will feel safe, welcomed and loved at Kidlings. During school terms Kidlings runs for the duration of the Sunday service and you can register your child 10 minutes before our 8am and 10am services. When you arrive at Gateway Mackenzie, look for the large Kidlings sign on the ground level of the Kids and Youth Building. Once you arrive our team will help register your kids and you will receive a name tag sticker for your child plus a security sticker for you to keep. You will need this security sticker to collect your child from Kidlings. Please let us know if your kids have any allergies or additional needs during the check in time. We know leaving your child at Kidlings for the first time may be challenging. You are welcome to stay with your child until they feel comfortable and familiar with the Kidlings space and our team. All of our Kidlings staff and volunteers have completed comprehensive training and those over 18 hold a current Blue Card. Our Kidlings kids enjoy free play, sing some praise and worship songs, and listen to a Bible story. We reinforce the key idea of the morning with fun games and activities. When you collect your child you will receive an activity sheet with the Bible story and ideas for things to do at home during the week. Our Purple Room in Kidlings is a sensory-friendly retreat space for young children who find it a bit overwhelming to be in the larger group. The space has been designed to accommodate the individual needs of each child while still teaching them Biblical truths and the love of Jesus. We would love to partner with your family to provide the best possible environment for your child. At Gateway Kids we’re growing a generation of kids who know God, love God, live for God and share God with others. You’ll sing, jump and dance, learn more about the Bible and God and hang out with a whole lot of other kids! During school terms Kidzone runs for the duration of the Sunday service and you can register your child 10 minutes before our 8am and 10am services. When you arrive at Gateway Mackenzie, look for the large Kidzone sign on the ground level of the Kids and Youth Building. Once you arrive our team will help register your kids and you will receive a name tag sticker for your child plus a security sticker for you to keep. You will need this security sticker to collect your child from Kidzone. Please let us know if your kids have any allergies or additional needs during the check in time. It’s the Friday afternoon chill out! You’ll make friends, play games and have fun at KidsClub. Kids in Prep to Grade 6 meet in Kidzone for an afternoon of fun! KidsClub happens during the school term and costs $3 per child. We aim to connect kids with each other, with great leaders and with God through engaging activities, super fun games and awesome theme nights. Check out the postcard to see what is happening at KidsClub this week. Little kids love music, singing and dancing – and that’s what Mainly Music all about! You and your little one will enjoy a 30 minute group music session together. Afterwards we share morning tea, our kids play and you’ll get to chat and connect with other parents and carers. 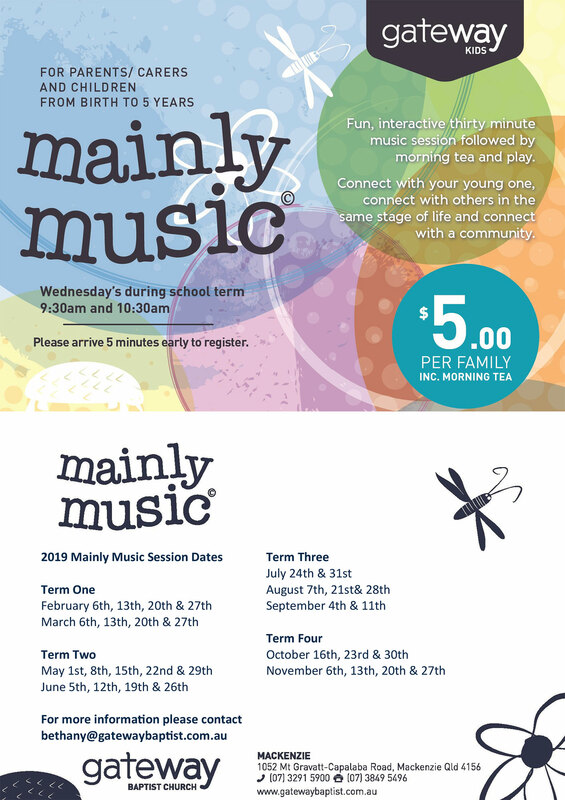 Choose which Mainly Music session works best for you – 9.30am or 10.30am each Wednesday during school term. Cost is $5 per family and includes morning tea. Register on arrival.